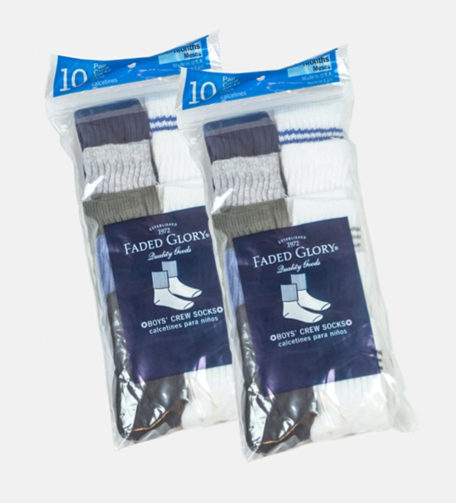 20-Pack Faded Glory Infant Boys Crew Socks Only $6.99 + FREE Shipping (Reg. $20)! You are here: Home / Great Deals / 20-Pack Faded Glory Infant Boys Crew Socks Only $6.99 + FREE Shipping (Reg. $20)! What an amazing stock up deal you can snag right now on this 20-Pack Faded Glory Infant Boys Crew Socks, on sale for only $6.99 + FREE Shipping (Reg. $20)! Each order comes with two 10-packs of socks which include white and colored variants. Pictured assortment of socks represent exact colors of a single pack.